In Mythologies, Roland Barthes interprets things that are quintessentially French, so I thought I’d do something quintessentially American. I decided to look at street art and found this painting featuring Obama almost instantly. The image is relatively simple; it features Obama in a pose and color scheme similar to his campaign posters for the presidency in 2008. The image requires some knowledge but assumes that its audience has some knowledge of politics in America in the recent past; this creates the mythological level to its analysis. At the first level of analysis, the denotative level, this is an image of Barack Obama painted onto the side of a building in spray paint with words next to his head. The signifier in this instance is Obama, or rather art featuring Obama. When you look at the whole image and read the text next to Obama’s head it becomes clear that this image is a signifier of a primary level signified political statement. Signifier and signified together make the sign which is a call for change in the government of America. The first level of signification, which Roland Barthes calls denotation, becomes the signifier for the second level of signification, connotation. “[Roland Barthes] claims that it is at the level of secondary signification or connotation that myth is produced for consumption.” (Storey, 119). At the second level of analysis the signifier becomes a call for change in the government of America. The connotative values of this image vary widely depending on various factors. The audience of the image for one, we can safely assume that since this is a painting of an American presidential candidate the primary audience of the image is Americans; however, that is a very broad term. A lower class American might view this image differently than a wealthy American. Regardless of class, this image is a call to action that any American can respond to. At this second level of analysis the text becomes much more important. 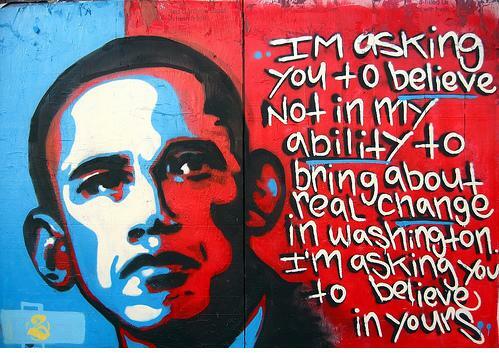 The words “I’m asking you to believe not in my ability to bring about real change in Washington. I’m asking you to believe in yours.” coupled with an image of Obama invoke emotion (whether positive or negative) related to the government in America at the time of the 2008 election. The signifier of a call for change in the government of America coupled with the statement in the picture leads to the signified that the people must act in order to incite change. The myth here is that Obama and his policies are the change that is best for America. The words call to the voters to change the way their nation is governed, and to do it by voting for Obama. The art is no longer passive; it is an active force calling to its audience, the people of America, to create change in their society. If the American people wish to change how their nation is governed, then they have the power and the responsibility to do so. This image works on several levels, but I think the most prominent reason is its relation to an already existing message. The image of Obama in this color scheme is associated with the word “change” and the idea of changing how our nation is run in order to get ourselves back on track. The image of Obama, carrying with it this idea of change, when coupled with a more detailed and slightly different call to action evokes a political and, to a certain extent, a patriotic mindset. In short, the image works because it sticks in our minds not as a slogan but as a call to the American people to act, because that is what our system of government requires us to do. Great breakdown, Tom — and we’ll discuss this more in class — but why is it a *myth* and not truth?